The Denis Wick range of wooden mutes is designed to provide modern brass players with a mute which sounds great, even at the quietest of dynamics. This mute will carry on working even at the end of an extreme diminuendo - it will allow the tone to drop almost nothing. Denis Wick has achieved this by a unique construction method which uses beautiful wood, with all its natural attributes of strength and resonance, and a very hard inner lining, made of a hi-tech modern material, which gives rigidity and enhances the acoustic properties of the mute. The use of wooden mutes is popular in European orchestras and helps create that distinctive muted sound which is so useful in nineteenth-century orchestral music. They are especially useful when used in opera, where often a very soft pianissimo is required. Denis Wick wooden mutes can be found in many leading opera houses around the world, including the Royal Opera House, Covent Garden and the Teatro alla Scala, Milan. The Denis Wick wooden French horn mute is the choice of mute for many professional horn players around the world. With its perfect intonation, beautiful tone and instant response it is the leading mute of its kind. It has adjustable tuning which allows the mute to be adapted to suit every kind of French horn. The mutes are very light and resonant, and are also very rigid. They are all individually hand-crafted. The bases are made from a solid piece of marine ply and the wooden 'cone' from Finnish birch wood. The inner lining is applied by a special method which ensures maximum strength and resonance. 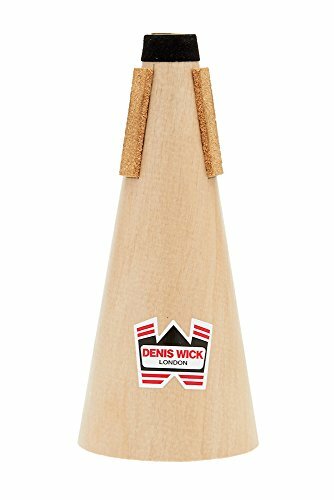 Denis Wick wooden mutes are used widely in bands and in orchestras: their excellent intonation and all-round performance makes them a great choice for any brass player. They are made in different sizes for most brass instruments, including all brass band and orchestral brass instruments, from Eb trumpet/soprano cornet down to Babb tuba.